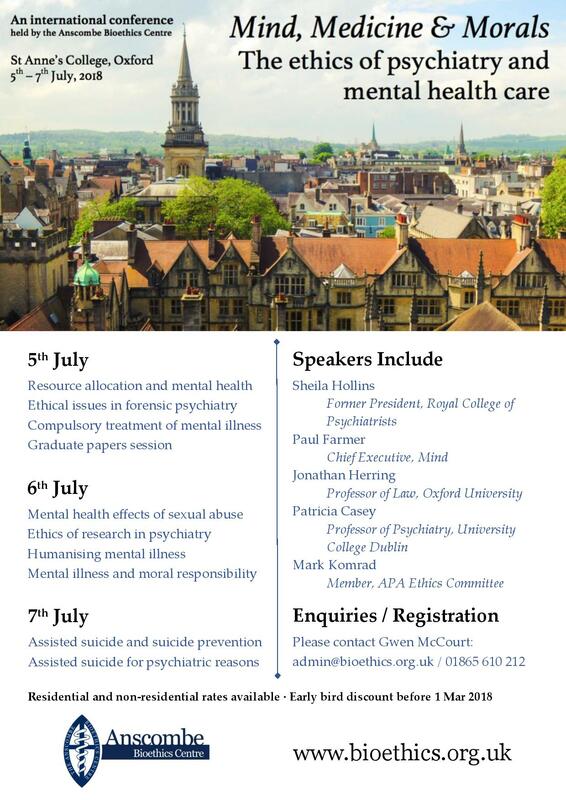 An international conference on the ethics of psychiatry and mental health care, held by the Anscombe Bioethics Centre. Speakers include Baroness Sheila Hollins (Former President of the Royal College of Psychiatrists), Paul Farmer CBE (Chief Executive of Mind), and Jonathan Herring (Professor of Law at Oxford University). This conference will explore topics such as resource allocation and mental health, ethics of research in psychiatry, compulsory treatment of mental illness, assisted suicide for psychiatric reasons and the mental health effects of sexual abuse.